~An Amazon Gift Card of $60! ~ A Gift Certificate from Baker Creek Heirloom Seeds! Check out the Giveaways Now! We are happy to bring you the series: Your Best Garden Ever! Because we know it will be ~ Your best garden ever! We've invited expert gardeners from all over the world to educate, inspire and encourage you in your garden planning this year! Because when the snow is blowing and the wind is howling we know what you are doing. . . Planning that garden! We are so happy to have you! We know you will find good information for your garden whether you planted your first seeds while wearing diapers or if you are planning your very first garden ever! This series will run from January 28-February 12. We hope you will take advantage of the knowledge of our expert speakers, the Great Giveaways, and the abundant freebies! If you are a member of our Beanpost Farmstead Community you will have a heads up each time there is a new post, if not, we would love to have you! Now to introduce you to our amazing guest authors! Sarah Walker Caron is the writer behind Sarah's Cucina Bella, a food blog that focuses on quick and easy from-scratch cooking. There she also writes about her family's gardening adventures, travel, and favorite books. She's also the author of five books including The Super Easy 5-Ingredient Cookbook and One-Pot Pasta. When she's not blogging, she is the editor of Bangor Metro Magazine and HelloHomestead.com. Frank from MyGreenTerra is a homesteader who is committed to promoting the concept of growing your own food. He enjoys sharing ideas, tips and tricks around food growing and encouraging others to participate in this healthy alternative to store bought food. 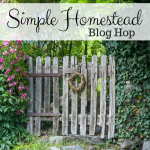 AnnMarie Lewellyn is a homesteader in Central Florida who writes about homesteading and planning your time. Thanks to all who participated and made it a success! The winners of this giveaway are. . .
~Amazon gift card winner is Becca Moore! ~Baker's Creek Heirloom Seeds gift certificate winner is Rachel Dial! ~Seed collection from Mary's Heirloom Seeds winner is Lisa Lombardo!